Rep. Chris Collins delivers a speech at the Republican National Convention in 2016 in Cleveland. Collins was the first sitting member of Congress to endorse Donald Trump's presidential bid. 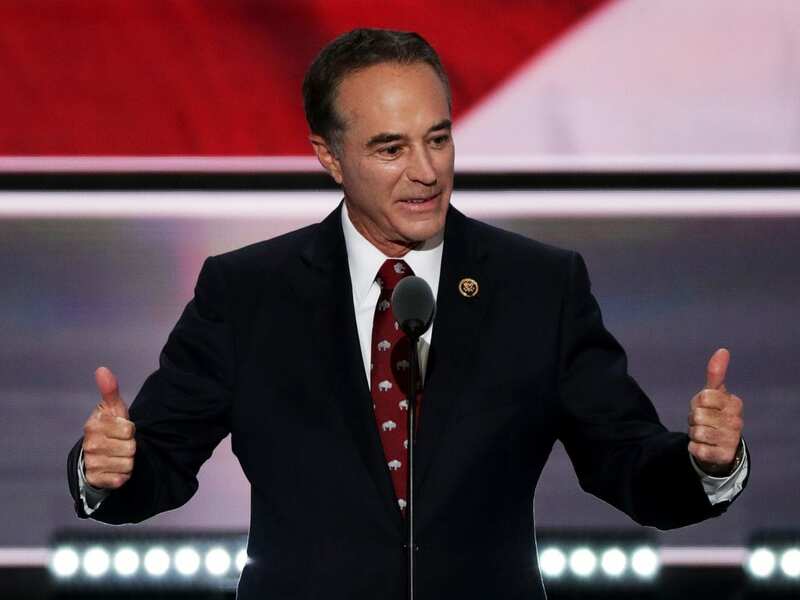 Rep. Chris Collins, R-N.Y., was arrested Wednesday on charges related to insider trading. A federal grand jury accused the Buffalo-area lawmaker of passing nonpublic information about a biotech company to his son, who traded on the information and passed it along to others. Collins was indicted along with his son, Cameron, and Stephen Zarsky, the father of Cameron’s fiancée. According to the newly-unsealed indictment, timely sales based on inside information allowed Cameron Collins, Zarsky and others to avoid losses totaling more than $768,000 when the biotech company, Innate Immunotherapeutics, failed a key clinical trial. Rep. Collins was a director of the company and also a major investor. According to the indictment, Collins was attending the congressional picnic at the White House on June 22, 2017, when he received an email from Innate’s CEO, notifying him that a promising drug had failed a clinical trial. Within minutes, Collins telephoned his son, who then passed the information along to others. “The crime that he committed was to tip his son Cameron so that Cameron and a few select others could trade on the news while the investing public remained in the dark,” Berman said. Collins and the other defendants are charged with securities and wire fraud, conspiracy and lying to investigators. The congressman pleaded not guilty and was released on bond. Collins stressed that he had not sold any of his own shares in the company. His stock lost 92 percent of its value after the adverse results of the clinical trial were made public. According to the indictment, the elder Collins was not able to sell his stock because it was held in Australia, where trading had been halted in advance of the company’s announcement. Over-the-counter trading continued, however, in the U.S., where Cameron Collins’ and Zarky’s shares were held. Collins’ dealings with Innate Immunotherapeutics are also the subject of an ongoing congressional ethics probe. He had promoted the stock to former Rep. Tom Price, R-Ga. Price’s own holdings in the company became an issue when he was nominated to be President Trump’s first secretary of health and human services. House Speaker Paul Ryan, R-Wis., called on the House Ethics Committee to conduct its own review of the new allegations against Collins. The Securities and Exchange Commission filed a parallel civil complaint that seeks to bar Collins from serving as an officer or director of any public company in the future. Collins, who is one of the wealthiest members of Congress, was the first member to publicly endorse Donald Trump during the 2016 presidential campaign. He also served on Trump’s transition team. The nonpartisan Cook Political Report rates the district as likely to remain in GOP hands. Collins is believed to be the first member of Congress to face charges related to insider trading, even though lawmakers are privy to all kinds of inside information and some are active stock traders. A study of stock trades by U.S. Senators in the 1990s found they outperformed the market by an average of 12 percent per year. “They’re either geniuses at the stock market, or they know something that we don’t know,” said Craig Holman, a lobbyist with Public Citizen’s Congress Watch division. In 2012, after a “60 Minutes” expose, Congress passed a law requiring members to disclose their stock trades within 45 days. Since that new transparency standard took effect, Holman said, the volume of trading on the Senate side has declined by more than two-thirds.